Panna cotta is a luxurious creamy Italian dessert that is dead simple to make. Milk is heated until bubbles just begin to appear on the side of the pan. Gelatin, vanilla beans, and sugar are added and then the mixture is poured into individual cups. This dessert needs to time to set in the refrigerator before serving so plan accordingly. 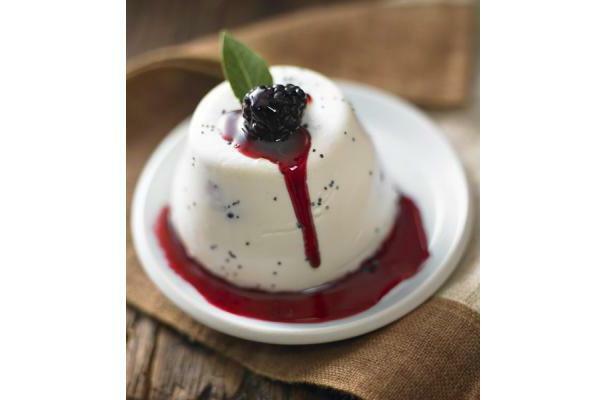 To finish the panna cotta, serve with a drizzle of homemade berry sauce. Fill a bowl with water, add the gelatin and let is soak. Pour milk into a pan & bring to just below simmering, then remove the pan from the heat. Do NOT let it boil. Drain & squeeze out the gelatin & add the milk. Pour the cream into another pan, add the sugar and vanilla bean and bring to a boil over low heat, stirring constantly. Immediately remove the pan from the heat, remove the vanilla bean and stir in the milk mixture. You can put the mixture into any kind of ramekin, mold, cup, you like. Rinse your 'glass' in ice-cold water, shaking out any excess water & fill with the milk mixture. Chill in the refrigerator for several hours until set (at least 3-4 hours). Turn out onto a serving dish & serve with fruit sauce or chocolate sauce. Put the berries, sugar & water in a pot & simmer for 15-20 minutes until the fruit breaks down & forms a syrup. Drizzle over the top of the panna cotta once on the serving plate.